It’s exactly ten years to the day since three members of the Hearts dressing room made headlines around the country for an impromptu press conference. To mark the anniversary, we look back on the incident which defined a lot of the problems within the club at the time. Club captain Steven Pressley, flanked by influential first-team players Craig Gordon and Paul Hartley, hijacked a press conference to expose the turmoil within the Hearts dressing room. Pressley read out a pre-prepared statement calling for an end to ongoing circus at Tynecastle under the leadership of Vladimir Romanov. Hearts were already in something of a mini-crisis before the event. Manager Valdas Ivanauskas had been put on leave by following a poor start to the season, with Eduard Malofeev taking control of the side. 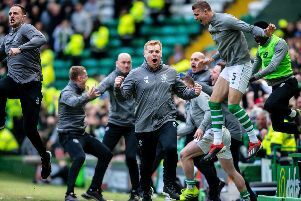 Having had two managers sacked the season prior, when Hearts finished second and won the Scottish Cup, the players were already fed up with the constant changes, which helped contribute to what Pressley described as “significant unrest in the dressing room”. Not at all. Hearts, on and off the field, would only get worse. They finished fourth that season when the objective had been to challenge for the title, while the merry-go-round continued at the manager’s position. It would only come to an end 14 months later when Stephen Frail was given the head coach’s role, before he was succeeded by Csaba Laszlo and Hearts started to resemble a functioning football team once again. All three started the following day’s game against Dunfermline, a disappointing 1-1 draw. Malofeev gave a bizarre post-match interview where he angrily insisted there were no problems at Hearts and the three players could say what they liked because it was a “democracy”. A short time later, the actions of Romanov would prove this was not the case. Pressley was stripped of the captaincy and dropped from the starting XI for a trip to Falkirk. Though he would return for a 0-0 draw at Inverness CT, he was out the door for good a short-time later. Hartley and Gordon were each disciplined by the club and dropped from the starting XI. Both would be brought back into the fold, probably because they were worth a lot of money as saleable assets. Hartley would leave for Celtic in January for £1 million; Gordon would be bought for £9 million from Sunderland the following summer. Gordon is the only one of the trio still playing, which is a terrific achievement after injuries wrecked his time at Sunderland. He’s the current No.1 at Celtic. Hartley almost came back to Hearts as a player, but decided to move to Aberdeen instead when the Tynecastle ownership tried to have him sign a statement which expressed regret and remorse for the Riccarton Three saga. He then moved into management, first with Alloa Athletic and then Dundee. Pressley would move to Gordon Strachan’s Celtic side, where he would win the league title in his first season. He has also had a few stints in management. His latest was at Fleetwood Town, who he left this past summer.